For the firearms accessory, see speedloader. A fast loader is a software program for a home computer, such as the Commodore 64 or ZX Spectrum, that accelerates the speed of file loading from floppy disk or compact cassette. Fast loaders came about because of a discrepancy between the actual speed at which floppy drives could transfer data and the speed that was provided by the operating system's default routines. This discrepancy was most pronounced on the Commodore VIC-20 and 64. While the earlier Commodore PET series had used an industry-standard IEEE-488 parallel bus, this was replaced with a custom Commodore serial bus on the VIC-20. The serial bus was intended to be nearly as fast as its predecessor, due to the use of the 6522 VIA as a hardware shift register on both the drive and computer. However, hardware bugs were discovered in the 6522 that prevented this function from working consistently. As a result, the KERNAL ROM routines were hastily rewritten to transfer a single bit at a time, using a slow software handshaking protocol. Although the C64 replaced the 6522 VIA with two 6526 CIA chips, which did not suffer from this bug, the companion 1541 disk drive still had a 6522 VIA. Commodore chose not to redesign the 1541 hardware, also in order to retain backward compatibility with VIC-20 peripherals; this however came at the expense of speed. Because of the transfer protocol, the Commodore 1540 and 1541 disk drives soon gained a reputation for extreme slowness. Only at the introduction of the Commodore 128 computer and the Commodore 1571 disk drive was the original plan put into action and a hardware shift register was used, reducing the need for special fast loaders. Soon after the C64's release, some astute programmers realized that Commodore's bit-banging serial KERNAL routines were unnecessarily sluggish. Since the CPU in the C64 ran at approximately the same speed as that in the 1541 disk drive, it was sufficient to synchronize only at the beginning of each byte, rather than at each individual bit. Moreover, this transfer method allowed two bits to be sent simultaneously, one over the standard DATA line and one over the CLK line (which was normally used to perform the handshaking). On the C64, this required very careful timing to avoid interference from interrupts and from the VIC-II graphics chip, which could "steal" CPU cycles. Some fast loaders disabled interrupts and blanked the screen for this reason. A fast loader would generally "wedge" itself into the LOAD vector at $0330, thus intercepting any calls to the KERNAL LOAD routine. Next, the fast loader would transfer the necessary code into the drive RAM and order its execution, then receive the file sent by the altered transfer code. Depending on the exact nature of the routines used, the loading speed could be improved by as much as a factor of five. This technique was used for a few of the many fast-load systems made (such as JiffyDOS). Others were simply more efficient in I/O and file handling, offering marginal to good improvement. Other products added parallel hardware. Various software companies released fast loaders for the C64, usually in cartridge form. In the United States, probably the most popular such cartridge was the Epyx FastLoad. Most fast loader cartridges also incorporated other features to increase ease of use. An on-board implementation of Commodore's DOS Wedge was included in most fast loader cartridges. Machine language monitors, disk editors, and various convenience commands for Commodore BASIC were also common additions. Some fast loader cartridges were very sophisticated, incorporating a reset button, "freeze" capabilities, and a simple onboard GUI. The Final Cartridge III was perhaps the most successful of this genre. A few commercial fast loaders, most notably CMD's JiffyDOS, were not cartridge-driven but instead replaced the KERNAL ROM in the C64 and the DOS ROM in the 1541. While these were more difficult to install, they offered greatly increased compatibility, being almost invisible to software running on the machine. The cartridge, Action Replay MK6 RAM loader loads a 202 block program in around 9 seconds. Its Warp loader is 25 times faster, but programs can only be loaded with a loader saved to disk when the cartridge is not present. Whereas the ARMK6 fastloader was compatible with most software, the TFC III was known to crash often, so programs had to be loaded in normal C64 mode, deactivating the cartridge, making it more or less useless. 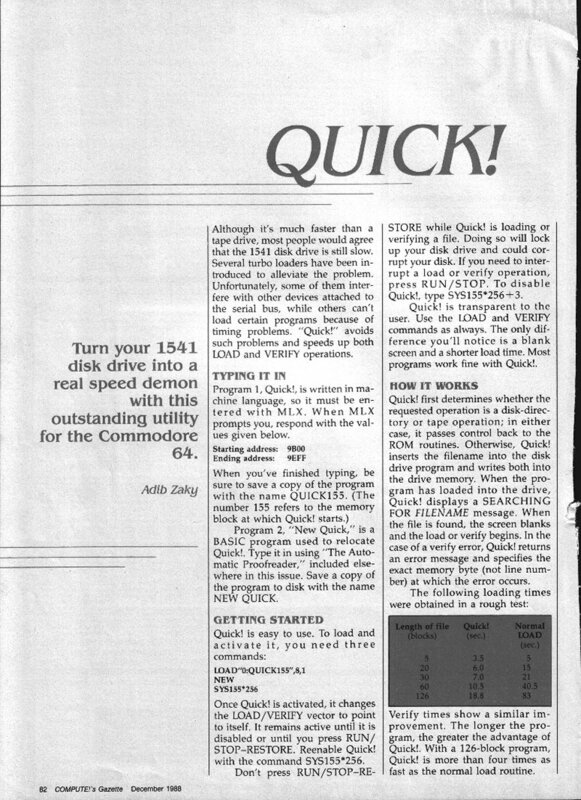 Many commercial programs for the C64, especially games, contained their own fast-loading routines on the distribution media. The user would load a small "stub" program from the disk with the standard slow routines, which would then install faster transfer routines in both the computer and the drive before proceeding to load the rest of the program at high speed. This way, the user benefited from the fast loader without having to buy or know about a dedicated fast-loader product. 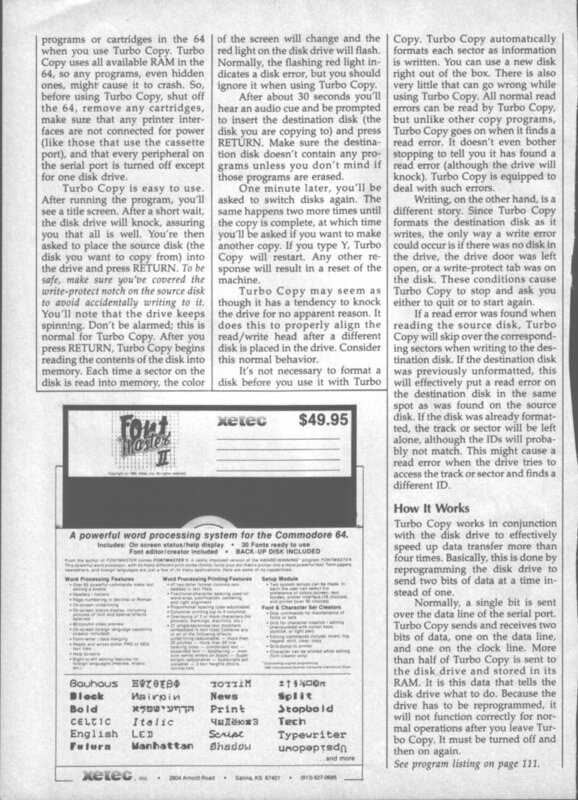 Several popular Commodore magazines published type-in fast loading software. 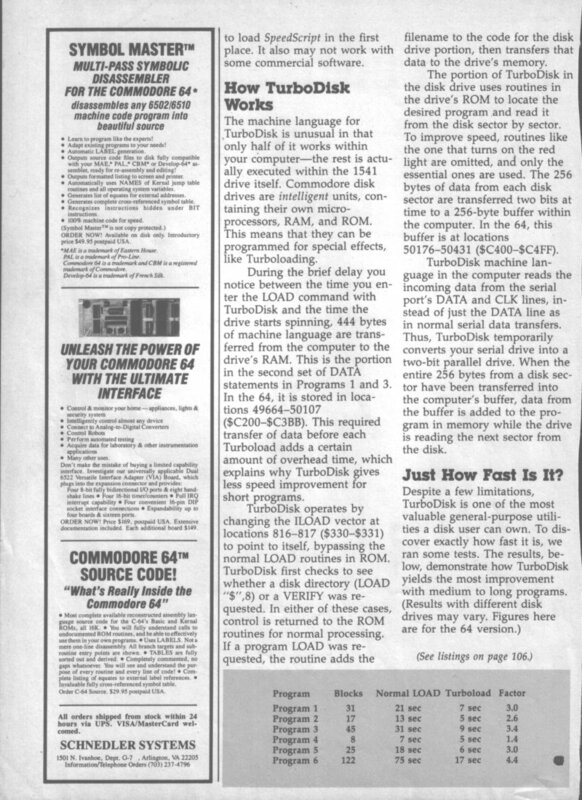 In April 1985, Compute! 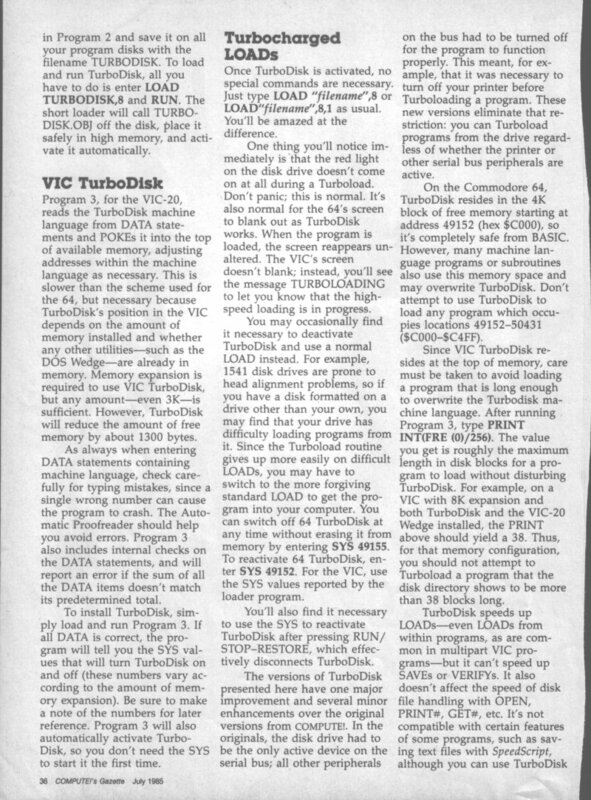 published TurboDisk, a fast loader that included C64 and VIC-20 versions. 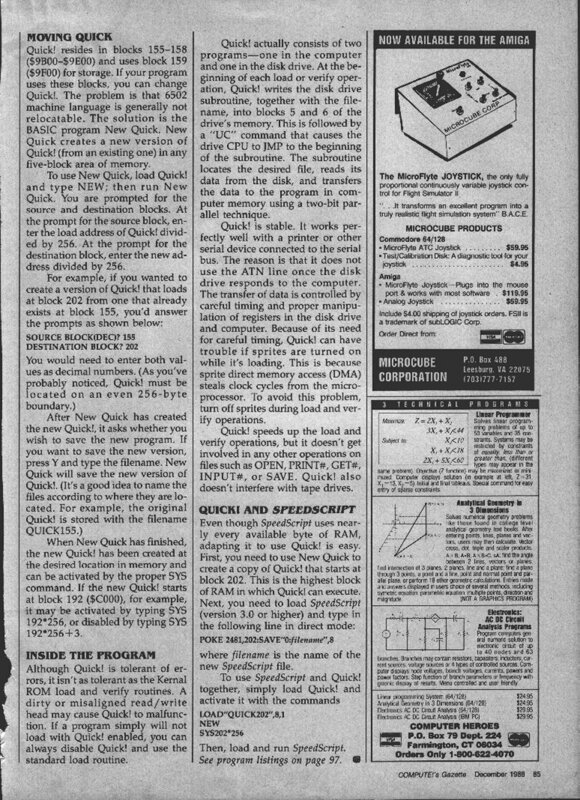 This program proved popular and was republished in the July 1985 issue of Compute! 's Gazette. 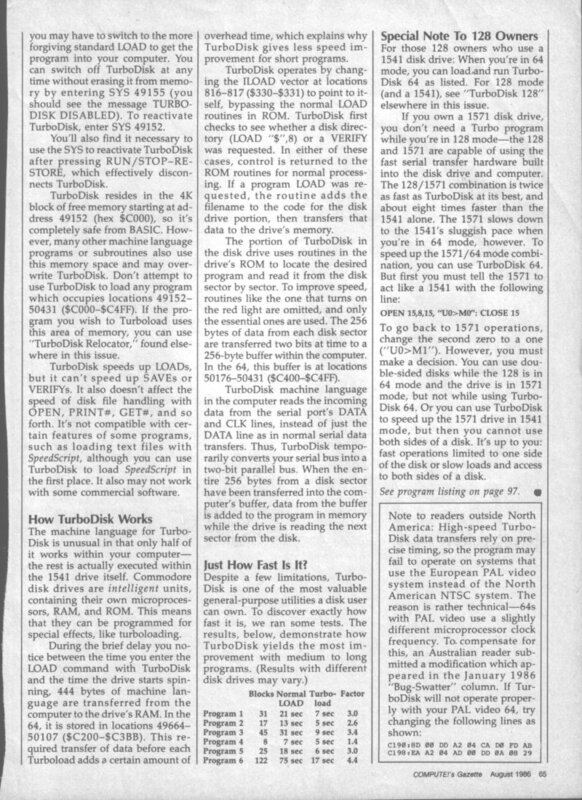 It was printed yet again in August 1986, without the VIC-20 version, but with several accompanying utilities to relocate the program in memory and to create auto-booting software that took advantage of TurboDisk's speed. A Commodore 128 version was also included for those C128 users who still had 1541 disk drives. COMPUTE! 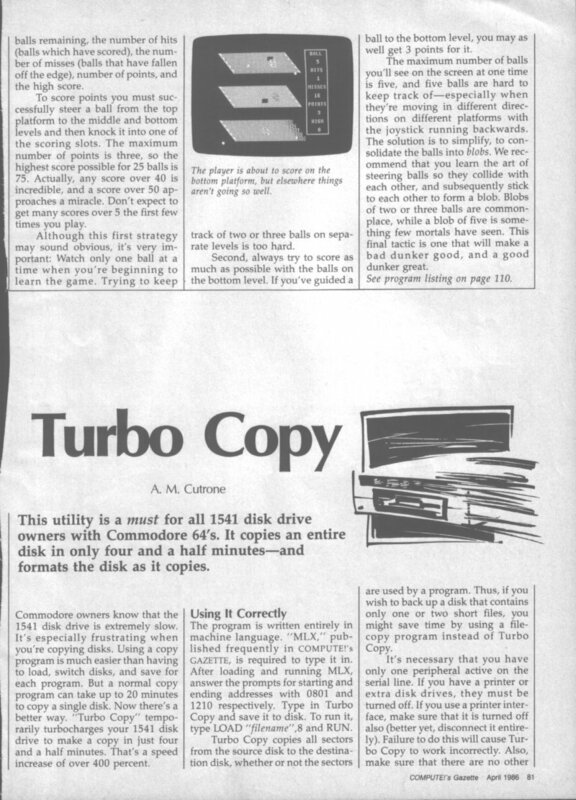 's Gazette also published several other utilities that speed up C64-to-1541 communications, including Turbo Copy (a 4-minute full-disk copier), TurboSave (a utility that accelerated the speed of disk saves) and Quick! (another fast loader). RUN Magazine published Sizzle! in December 1987, an integrated package that included a relocatable fast loader with autoboot generation capability. 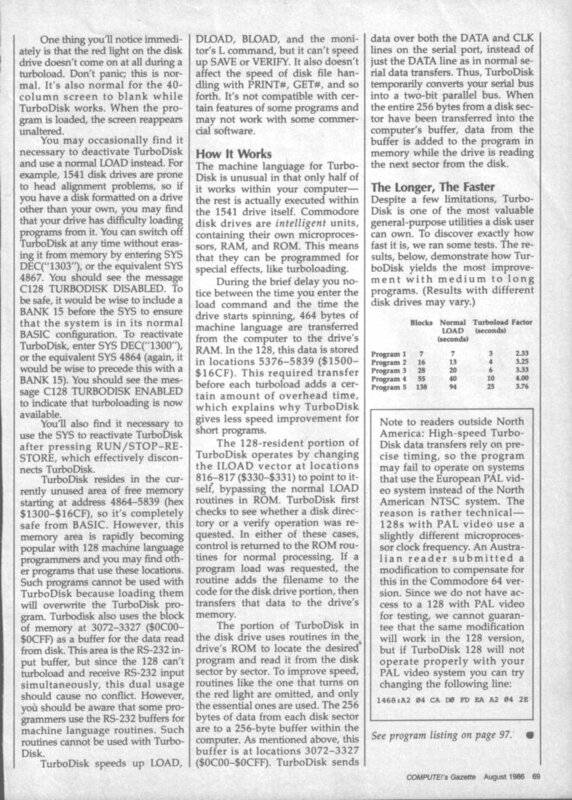 BYTE published Loader, a machine-language fast-loading software for Apple DOS 3.3, in November 1983. Compute! 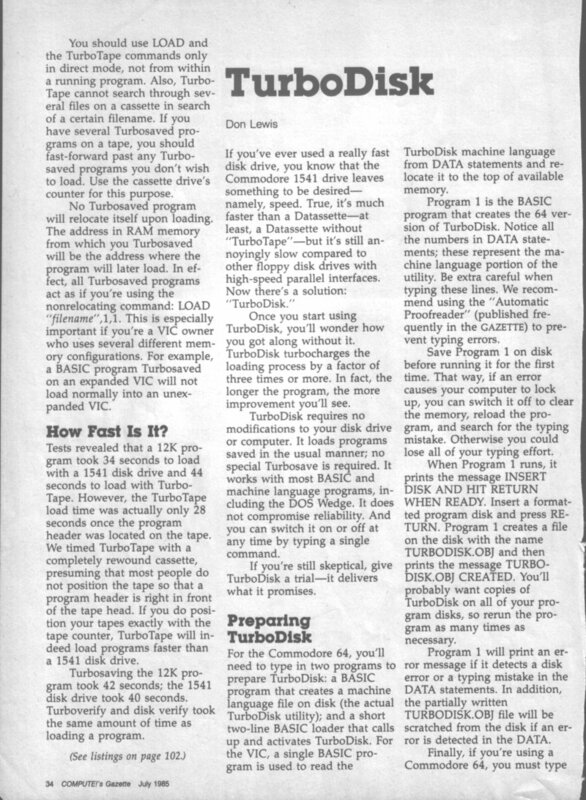 published TurboDisk for DOS 3.3 in October 1986. The built-in routines for storing and reading data to and from Compact Cassette tapes was made for safe storing rather than speed. Better tape-quality in the 1980s made it possible to store data more effectively, reducing loading time and tape length. Such programs existed for several computers, such as the Ohio Scientific Challenger. The PET Rabbit was one such program for the PET, while TurboTape was one for the Commodore Datassette. Turbo 2000 was a similar system for the Atari. Invade-a-Load was a fast loader for cassette-based games which not only accelerated the loading of blocks from the tape, but also contained a mini-game (in this case, a clone of Space Invaders) that could be played while waiting for the main game to finish loading. ^ Brain, Jim (1996-01-10). "Vic-20/C-64 serial ports - alt.folklore.computers | Google Groups". Groups.google.com. Retrieved 2012-09-26. ^ Lewis, Don (July 1985). "TurboDisk". COMPUTE! 's Gazette. p. 34. Retrieved 16 January 2013. ^ Lewis, Don (July 1985). "TurboDisk". COMPUTE! 's Gazette. p. 36. Retrieved 16 January 2013. ^ Lewis, Don (July 1985). "TurboDisk". COMPUTE! 's Gazette. p. 37. Retrieved 16 January 2013. ^ "Bug-swatter". Compute's Gazette. January 1986. p. 120. ^ Lewis, Don (August 1986). 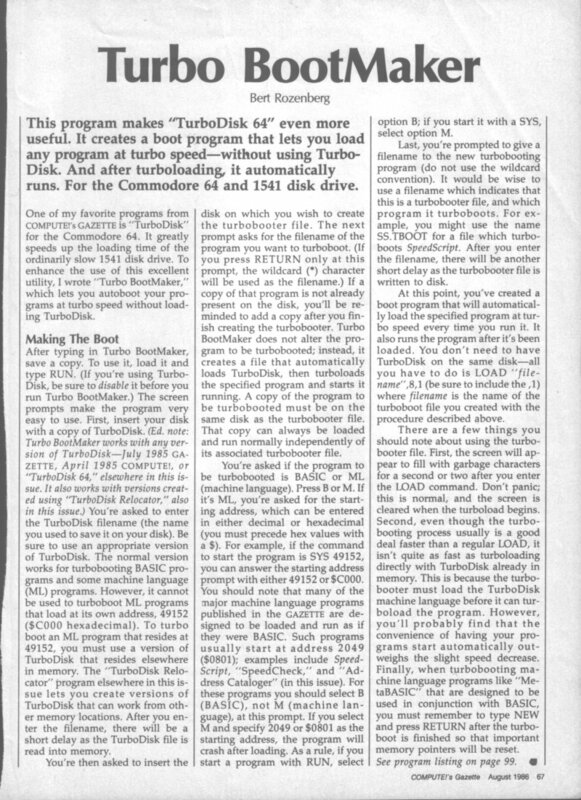 "TurboDisk 64". COMPUTE! 's Gazette. p. 64. Retrieved 16 January 2013. ^ Lewis, Don (August 1986). 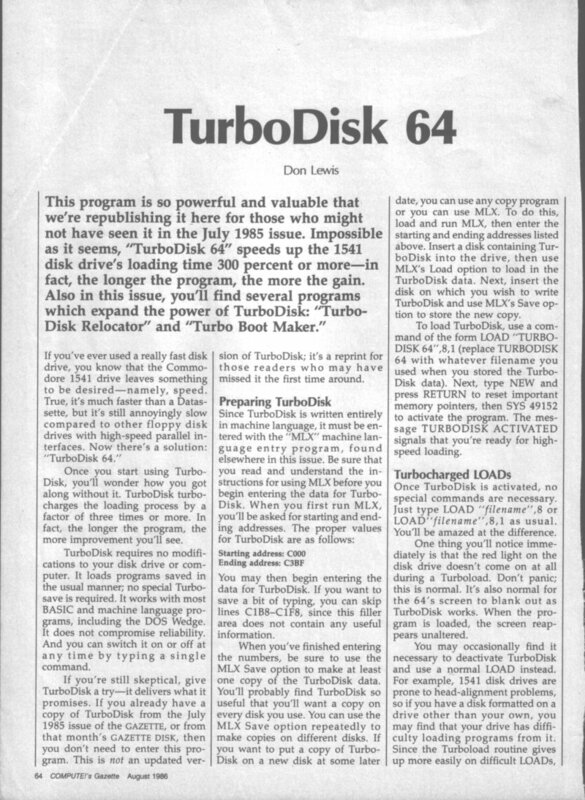 "TurboDisk 64". COMPUTE! 's Gazette. p. 65. Retrieved 16 January 2013. ^ Lewis, Don (August 1986). 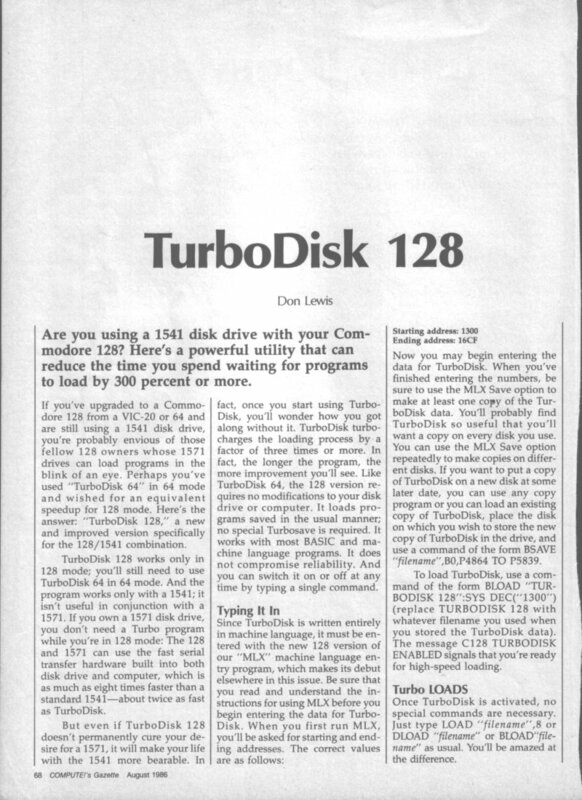 "TurboDisk 128". COMPUTE! 's Gazette. p. 68. Retrieved 16 January 2013. ^ Lewis, Don (August 1986). "TurboDisk 128". COMPUTE! 's Gazette. p. 69. Retrieved 16 January 2013. ^ Bavaro, Dino (August 1986). 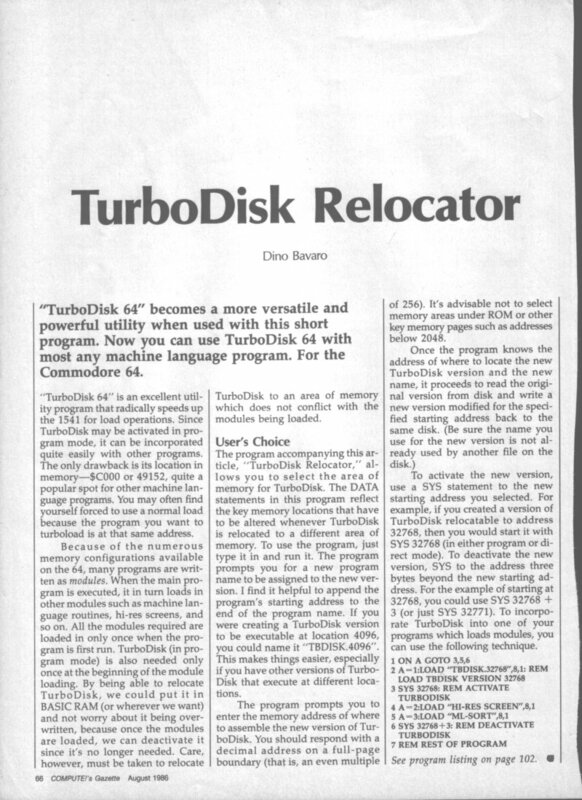 "TurboDisk Relocator". COMPUTE! 's Gazette. p. 66. Retrieved 16 January 2013. ^ Rozenberg, Bert (August 1986). "Turbo BootMaker". COMPUTE! 's Gazette. p. 67. Retrieved 16 January 2013. ^ Cutrone, A.M. (April 1986). "Turbo Copy". COMPUTE! 's Gazette. p. 81. Retrieved 16 January 2013. ^ Cutrone, A.M. (April 1986). "Turbo Copy". COMPUTE! 's Gazette. p. 82. Retrieved 16 January 2013. ^ Voosen, William (April 1987). 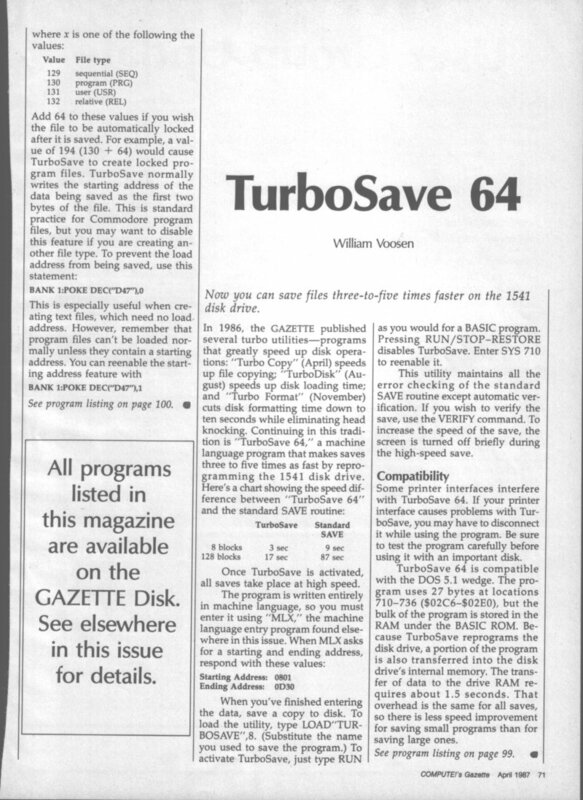 "TurboSave 64". COMPUTE! 's Gazette. p. 71. Retrieved 16 January 2013. ^ Zaky, Adib (December 1988). "Quick!". COMPUTE! 's Gazette. p. 82. Retrieved 16 January 2013. ^ Zaky, Adib (December 1988). "Quick!". COMPUTE! 's Gazette. p. 85. Retrieved 16 January 2013. ^ Williams, John (November 1983). "Fast Loading with Apple DOS 3.3". BYTE. pp. 502–504. Retrieved 19 March 2016. ^ Ellerbrock, R. (October 1986). "TurboDisk For DOS 3.3". Compute!. p. 83. Retrieved 9 November 2013. ^ Carlson, Edward H. (March–April 1980). "Fast Tape Read/Write Programs For Your OSI". Compute!. pp. 115–117. Retrieved 25 October 2013. ^ Strasma, James (March–April 1980). "The PET Rabbit". Compute!. p. 94. Retrieved 25 October 2013. ^ De Ceukelaire, Harrie (January 1985). "TurboTape / High-Speed Tape Utility For Commodore 64 And VIC-20". Compute!. p. 124. Retrieved 30 October 2013. ^ "Capute!". Compute!. March 1985. p. 146. Retrieved 30 October 2013. This page was last edited on 23 November 2018, at 03:29 (UTC).